If you wake up at 2:00 am to the sound of a window being smashed and you hear someone entering your house, here’s what you should ideally do: Gather all of your family members together in the same room, lock the door, call the police and have your gun ready in case the intruder should try and enter that room. However, we don’t live in an ideal world so it’s much more likely that if you hear someone breaking into your home at 2:00 am you’ll have to go confront them or at the very least, you’ll have to go to the top of your stairs and make sure the intruder doesn’t make it past you to get to your family members. 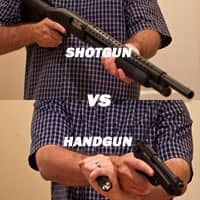 So, if the above ever happened to you, should you use a handgun or shotgun for home defense? Well, to tell you the truth, it depends on the situation. For instance, let’s say you’re a prepared homeowner and you’ve already rehearsed a “home invasion” plan with your family. So they know if they hear you shout a special code word they’re supposed to quickly run to your master bedroom. First off, there are a lot of corners in a house. And the last thing I want to do is have my long shotgun barrel sticking out around a corner so that an intruder can grab it and perhaps take my gun away. Also, if you have to enter other bedrooms on the middle floor or basement floor it’s much easier to open a door and bring a handgun to the “close contact firing position” than to clumsily open a door with the shotgun sticking out for a person to grab. Let’s not forget, if you’re trying to be “stealth” and sneak around your house so the intruder doesn’t know you’re coming, there’s a much better chance you’re going to knock your shotgun into a wall or hit something, especially if you haven’t practiced clearing your house with a shotgun, which most people haven’t. That’s why my handgun of choice for this situation is my concealed carry gun, the Glock 19. Of course, the gun you have at the time of a home invasion is the one you use whether it’s a shotgun, rifle, or handgun. But whatever gun you decide to go with I would practice the two scenarios above: Gathering your family in the safe room and clearing your house.